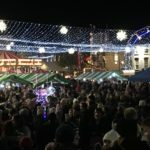 On 29th November, Warwick held its traditional Victorian Evening heralding the festive season with the switching on of the Christmas lights. And what an evening it was. Rain earlier in the day had passed, and there were clear skies as huge crowds gathered in the Market Place, and at St. Mary’s Church where this year there was the special double attraction of the Warwick Poppies display commemorating the end of WW1 and the opening of the Christmas Tree Festival. 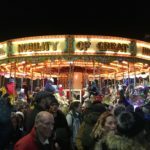 In the Market Place children were enjoying the traditional carousel, a big wheel, Punch and Judy and fairground stalls. 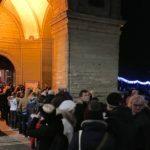 There were big cheers as the Mayor of Warwick counted down to the switching on of the lights – with a bigger and better display than ever thanks to local businesses and organisations. 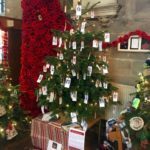 At the church there were long queues to see the poppies and the Christmas Trees, with live choral and silver band music. 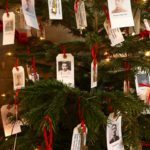 Many of the visitors stopped at Unlocking Warwick’s tree to look at the pictures of the local men who died in WW1, and to read about our project to find the stories behind the names on the war memorial. The displays in St. Mary’s will be there until December 9th. The church is open from 10am to 4pm. 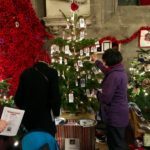 Entry costs just 50p and you will get a form to vote for your favourite tree. (Hint: Unlocking Warwick’s tree is Number 3).